To make Yerevan green again and reverse the city’s relentless quasi-formal construction boom has seemed a pipe dream for many years. But the city’s new mayor has undertaken an effort to reclaim some of the city’s lost parks, over protests by the workers who will lose their jobs. 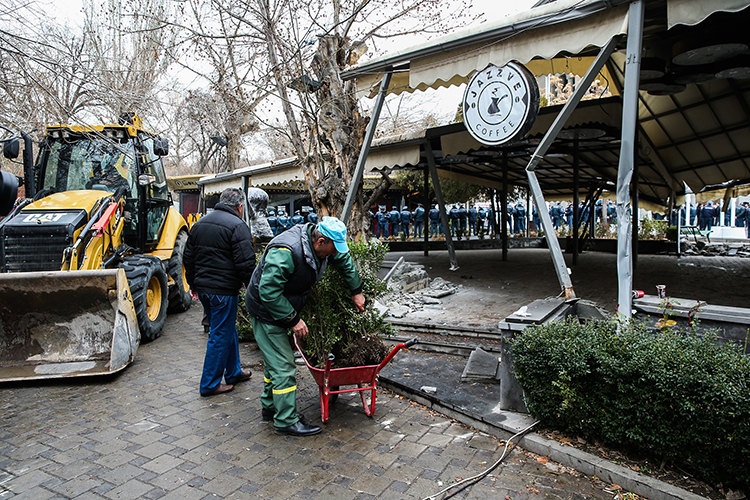 On March 13, city authorities began dismantling some of the dozens of cafes that have proliferated over the years on former parkland surrounding Yerevan’s central opera house. City workers and bulldozers, backed by rows of police officers cordoning off the area, tore down the structures and posted photos of it on the city government’s web page. The dismantling, which continued for several days, led to protests by workers at the cafes. Some clashed with police, during which several protesters and one police officer ended up in the hospital. The proliferation of cafes around the opera house dates from the early 2000s, when former city authorities rented out the land under dubious terms to politically well connected business people. While the cafes helped ensure that visitors to Yerevan’s center were never more than a few steps from a cup of coffee, many residents complained that they largely covered up what used to be the city’s green spaces. In addition, the contracts were so favorable that the city’s benefit was negligible, Marutyan complained. “How is it that the land next to the opera was rented for less than $200 a month?” he told journalists after a March 19 city council meeting discussing the issue. He added that the demolitions would continue beyond the opera area into other similarly blighted areas, but that they would be done gradually and would attempt to minimize disruption to the café owners and their employees. While café owners tried to argue that the dismantling violated contracts they had with the municipality, city officials said that everything was being done by law. “According to the agreements signed with the economic entities, the [city government] has the right to terminate the contract with a prior notice of 30 days,” the mayor’s spokesman, Hakob Karapetyan, said in a January 11 Facebook post announcing the municipality’s intentions. Some opposition political figures weren’t convinced.